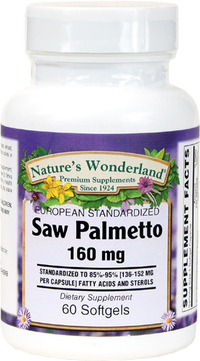 Saw Palmetto Standardized Extract - 160 mg, 60 Softgels (Nature's Wonderland) - Penn Herb Co. Ltd. Saw Palmetto is the leading herb of choice for promoting prostate comfort, healthy urinary function, and sexual health - especially for men over 50. 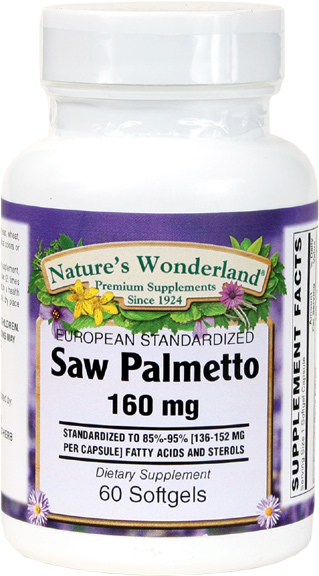 Nature's Wonderland standardized extract provides 85% - 95% fatty acids and sterols - the active therapeutic compounds in Saw Palmetto. Our Standardized Saw Palmetto Extract is made under strict European quality standards which are comparable to Over-The-Counter drug standards in the U.S. It provides optimal levels of naturally occurring fatty acids and sterols. Promotes prostate health; supports healthy urinary function; supports reproductive health. As a dietary supplement, adults take 1 softgel capsule daily with a meal, or as directed by a health care professional.